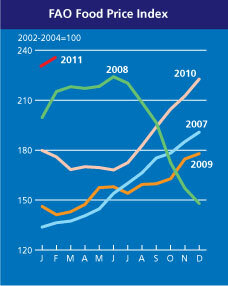 Higher agriculture commodity prices here to stay – this is the overall message of the OECD-FAO Agriculture Outlook 2011-20. I will add material to this post from the main report. There is a database attached to the report which will also yield spreadsheets, to be posted here in the weeks ahead. The OECD-FAO Agriculture Outlook 2011-20 has said that a good harvest in the coming months should push commodity prices down from the extreme levels seen earlier this year. However, the Outlook said that over the coming decade real prices for cereals could average as much as 20% higher and those for meats as much as 30% higher, compared to 2001-10. The press release has more of the big picture message from the Outlook. Some key questions and concerns have been mentioned. One of these is: what is driving price volatility? The Outlook takes a look at the key forces driving price volatility, which create uncertainty and risk for producers, traders, consumers and governments. About a period of higher commodity prices, the Outlook said commodity prices will fall from their 2010-11 levels, as markets respond to these higher prices and the opportunities for increased profitability that they afford. In real terms, agricultural commodity prices are likely to remain on a higher plateau during the next decade compared to the previous decade. All commodity prices in nominal terms will average higher to 2020 than in the previous decade. In real terms, prices are anticipated to average up to 20% higher for cereals and 50% higher for some meats, compared to the previous decade. On the forecasts of net agricultural production, global agricultural production is projected to grow at 1.7% annually on average compared to 2.6% in the previous decade. Slower growth is expected for most crops, especially oilseeds and coarse grains, while the livestock sector stays close to recent trends. Where biofuels and agricultural outputs are mentioned, the Outlook has said the use of agricultural output as feedstock for biofuels will continue its robust growth, largely driven by biofuel mandates and support policies. By 2020, 12% of the global production of coarse grains will be used to produce ethanol compared to 11% on average over the 2008-10 period. (1) Commodity prices rose sharply again in August 2010 as crop production shortfalls in key producing regions and low stocks reduced available supplies, and resurging economic growth in developing and emerging economies underpinned demand. A period of high volatility in agricultural commodity markets has entered its fifth successive year. 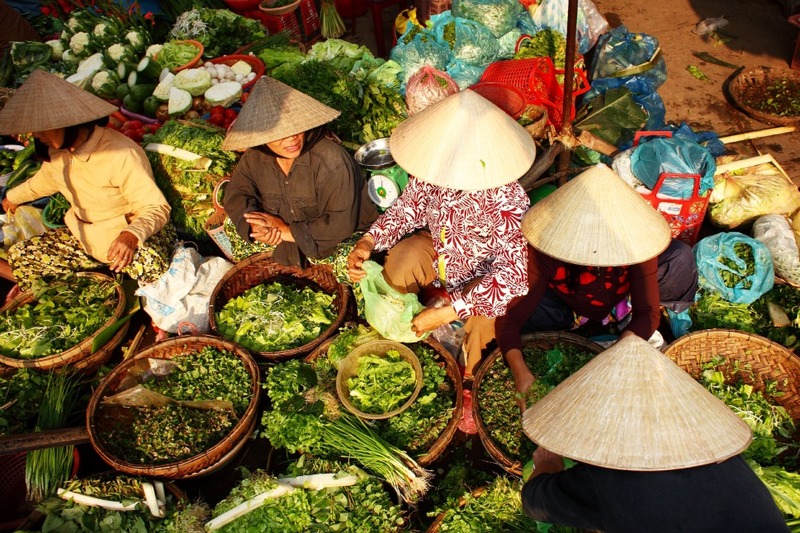 High and volatile commodity prices and their implications for food insecurity are clearly among the important issues facing governments today. This was well reflected in the discussions at the G20 Summit in Seoul in November, 2010, and in the proposals for action being developed for consideration at its June 2011 meeting of Agriculture Ministers in Paris. (2) This Outlook is cautiously optimistic that commodity prices will fall from their 2010-11 levels, as markets respond to these higher prices and the opportunities for increased profitability that they afford. Harvests this year are critical, but restoring market balances may take some time. Until stocks can be rebuilt, risks of further upside price volatility remain high. This Outlook maintains the view expressed in recent editions that agricultural commodity prices in real terms are likely to remain on a higher plateau during the next ten years compared to the previous decade. Prolonged periods of high prices could make the achievement of global food security goals more difficult, putting poor consumers at a higher risk of malnutrition. (3) Higher commodity prices are a positive signal to a sector that has been experiencing declining prices expressed in real terms for many decades and are likely to stimulate the investments in improved productivity and increased output needed to meet the rising demands for food. However, supply response is conditioned by the relative cost of inputs while the incentives provided by higher international prices are not always passed through to producers due to high transactions costs or domestic policy interventions. In some key producing regions, exchange rate appreciation has also affected competitiveness of their agricultural sectors, limiting production responses. (4) There are signs that production costs are rising and productivity growth is slowing. Energy related costs have risen significantly, as have feed costs. Resource pressures, in particular those related to water and land, are also increasing. Land available for agriculture in many traditional supply areas is increasingly constrained and production must expand into less developed areas and into marginal lands with lower fertility and higher risk of adverse weather events. Substantial further investments in productivity enhancement are needed to ensure the sector can meet the rising demands of the future. FAO’s March 2011 food price index, anomaly or turnaround? 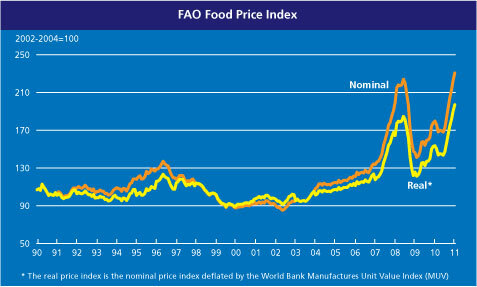 Global food prices decline, is the assessment of the Food and Agriculture Organisation (FAO) for 2011 March. 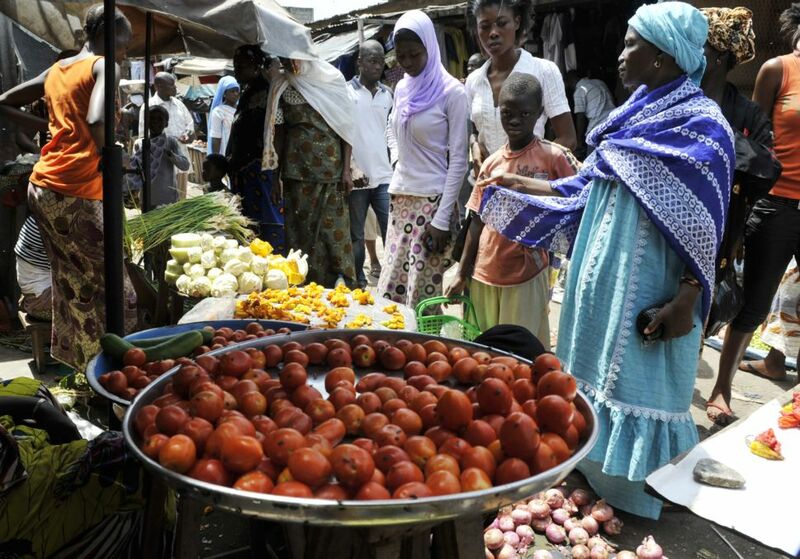 The FAO Food Price Index has shown its first decrease in eight months. “The food price index dropped some this month but only time will tell if this is the start of a reversal of the upward trend,” said FAO. The Index averaged 230 points in March 2011, down 2.9 percent from its peak in February, but still 37 percent above March of last year. “The decrease in the overall index this month brings some welcome respite from the steady increases seen over the last eight months,” said David Hallam, Director of FAO’s Trade and Market Division. “But it would be premature to conclude that this is a reversal of the upward trend,” he added. “We need to see the information on new plantings over the next few weeks to get an idea of future production levels. But low stock levels, the implications for oil prices of events in the Middle East and North Africa and the effects of the destruction in Japan all make for continuing uncertainty and price volatility over the coming months,” said Hallam. 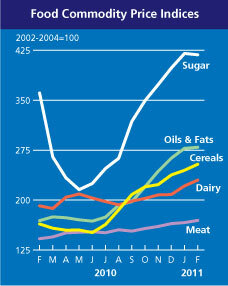 International prices of oils and sugar dropped the most, followed by cereals. By contrast, dairy and meat prices were up, although only marginally in the case of meat. The Cereal Price Index averaged 252 points in March, down 2.6 percent from February, but still 60 percent higher than in March 2010. March was extremely volatile for grains, with international quotations first plunging sharply, driven largely by outside market developments such as the increased economic uncertainties accompanying the turmoil in North Africa and parts of the Near East as well as the Japanese earthquake and tsunami, before regaining most of their losses. Rice prices also fell as a result of abundant supply in exporting countries and sluggish import demand. 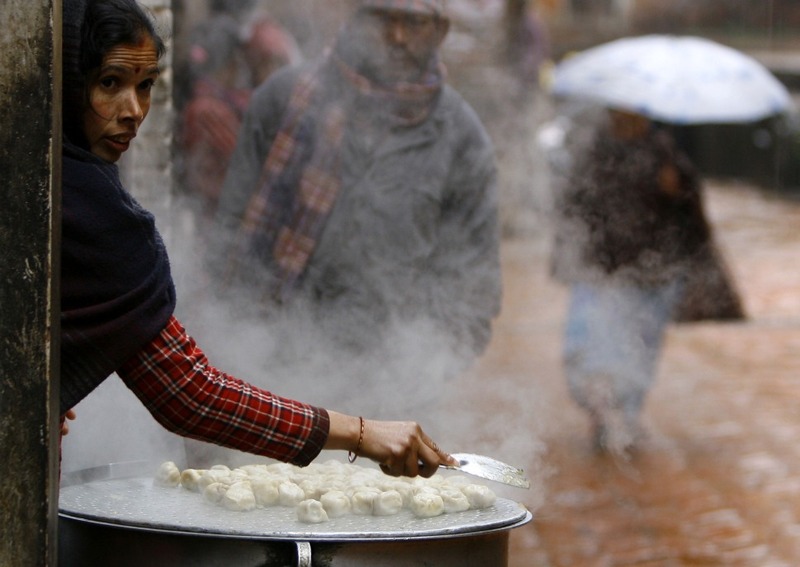 A positive outlook but food stocks diminish, said the FAO. World production of cereals fell in 2010, resulting in falling stocks, while total cereal utilization is expected to reach a record level in 2010/11. While most indications point to increased cereal production in 2011, the projected growth may not be sufficient to replenish inventories, in which case prices could remain firm throughout 2011/12 as well. Index details: The FAO Food Price Index (FFPI) averaged 230 points in March 2011, down 2.9 percent from its peak in February, but still 37 percent above March last year. 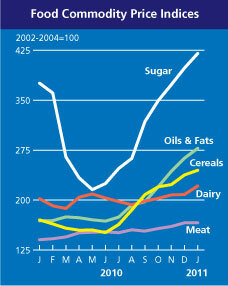 International prices of oils and sugar contracted the most, followed by cereals. By contrast, dairy and meat prices were up. The FAO Cereal Price Index averaged 252 points, down 2.6 percent from February, but still 60% higher than in March 2010. The past month was extremely volatile for grains, with international quotations first plunging sharply, driven largely by recent events in Japan and North Africa, before regaining most of their losses towards the end of the month, as markets reacted to a continuing tight world supply and demand condition. Rice prices also fell amid large availability in exporting countries and sluggish import demand. The FAO Oils/Fats Price Index fell 7 percent, to 260, interrupting nine months of consecutive rise. Last month’s slide in prices reflects primarily a recovery in global supply prospects for palm oil. The FAO Sugar Price Index averaged 372 points, down as much as 10 percent from the highs of January and February. The recent decline in international sugar prices was partly prompted by prospects of increased market availability, notably from India. The FAO Dairy Price Index averaged 234 points, up 1.9 percent from February and 37 percent above its level in March 2010. Firm import demand together with lower than expected production in Southern hemisphere supplying countries, where the milking season is coming to a close, continue to underpin world prices. The FAO Meat Price Index was little changed at 169 points in March. The upward trend in meat prices since 2010 has flattened in the past few months, reflecting trade disruptions in several key markets, particularly North Africa and Japan. How much grain will China import? How will it compare with their soybean imports? No one knows for sure, the Earth Policy Institute’s Lester Brown has said. 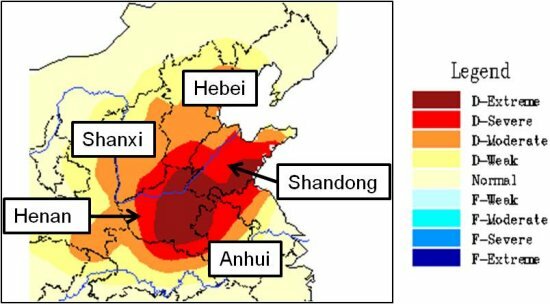 “But if China were to import only 20 percent of its grain, it would need 80 million tons, an amount only slightly less than the 90 million tons of grain the United States exports to all countries each year.” This would put heavy additional pressure on scarce exportable supplies of wheat and corn, said Brown. For China, the handwriting is on the wall, the Earth Policy briefing has stated, in ‘Can the United States feed China’. It will almost certainly have to turn to the outside world for grain to avoid politically destabilizing food price rises. To import massive quantities of grain, China will necessarily draw heavily on the United States, far and away the world’s largest grain exporter. To be dependent on imported grain, much of it from the United States, will be China’s worst nightmare come true. The UN Food and Agriculture Organization (FAO) has said that global food prices increased for the eighth consecutive month in February, with prices of all commodity groups monitored rising again, except for sugar. FAO said it expects a tightening of the global cereal supply and demand balance in 2010-11. In the face of a growing demand and a decline in world cereal production in 2010, global cereal stocks this year are expected to fall sharply because of a decline in inventories of wheat and coarse grains. International cereal prices have increased sharply with export prices of major grains up at least 70% from February last year. 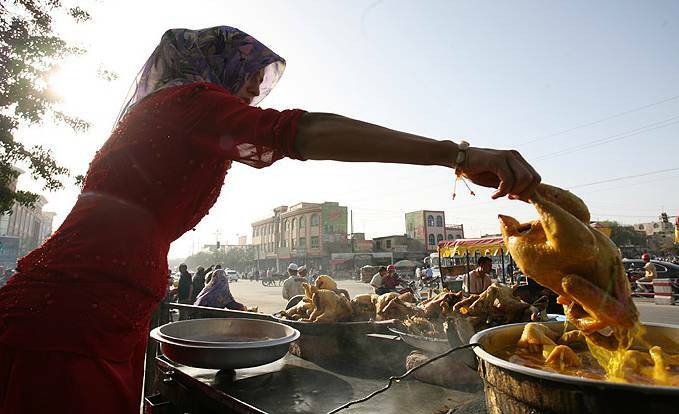 “Unexpected oil price spikes could further exacerbate an already precarious situation in food markets,” said David Hallam, Director of FAO’s Trade and Market Division. “This adds even more uncertainty concerning the price outlook just as plantings for crops in some of the major growing regions are about to start,” he added. Food Price Index – The FAO Food Price Index averaged 236 points in February, up 2.2% from January, the highest record in real and nominal terms, since FAO started monitoring prices in 1990. The Cereal Price Index, which includes prices of main food staples such as wheat, rice and maize, rose by 3.7% in February (254 points), the highest level since July 2008. The FAO Dairy Price Index averaged 230 points in February, up 4% from January, but well below its peak in November 2007. The FAO Oils/Fats Price Index rose marginally to 279 points in February, a level just below the peak recorded in June 2008. The FAO Meat Price Index averaged 169 points in February, up 2% from January. By contrast, the FAO Sugar Price Index averaged 418 points in February, slightly below the previous month but still 16% higher than February 2010. Cereal supply and demand – FAO expects winter crops in the northern hemisphere to be generally favourable and forecasts global wheat production to increase by around 3% in 2011.This assumes a recovery in wheat production in major producing countries of the Commonwealth of Independent States. So far, conditions of winter crops in those countries are generally favourable. The latest estimate for the world cereal production in 2010 is 8 million tonnes more than was anticipated in December but still slightly below 2009. This month’s upward revision reflects mostly higher estimates for production in Argentina, China and Ethiopia. 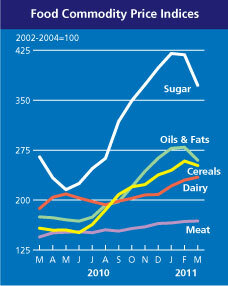 The forecast for world cereal utilisation in 2010-11 has been revised up by 18 million tonnes since December. The bulk of the revision reflects adjustments to the feed and industrial utilization of coarse grains. Larger use of maize for ethanol production in the USA and statistical adjustments to China’s historical (since 2006-07) supply and demand balance for maize are the main reasons for the revision. The updated estimates for foodgrain and commercial crops have been released by India’s Ministry of Agriculture. This is the first revision for 2011. There are updated estimates for rice, wheat, coarse cereals and pulses, and also for oilseeds, cotton, jute and sugarcane. I have updated my running spreadsheet with the new data. From the 2008-09 year the spreadsheet contains the advance estimates (1st, 2nd, 3rd, 4th/final estimates). The spreadsheet also has the final crop production data back until 1997-98. You’ll find more on the agriculture page. The FAO Food Price Index (FFPI) rose for the seventh consecutive month, averaging 231 points in January 2011, up 3.4% from December 2010 and the highest (in both real and nominal terms) since the index has been backtracked in 1990. Prices of all the commodity groups monitored registered strong gains in January compared to December, except for meat, which remained unchanged. Changes in the composition of the meat price index (read more) have resulted in adjustments to the historical values of the FFPI. One implication of this revision is that the December value of the FFPI, which previously was the highest on record, is now the highest since July 2008. The Cereal Price Index averaged 245 points in January, up 3% from December and the highest since July 2008, but still 11% below its peak in April 2008. The increase in January mostly reflected continuing increases in international prices of wheat and maize, amid tightening supplies, while rice prices fell slightly, as the timing coincides with the harvesting of main crops in major exporting countries. The Oils/Fats Price Index rose by 5.6% to 278 points, nearing the June 2008 record level, reflecting an increasingly tight supply and demand balance across the oilseeds complex. Food production and grain trade / FAO food price index tops the 2008 peak / Food inflation crippled India’s households in 2010 / Early price indicator for 2011 foodgrain / Only 16 points under the 2008 peak, FAO’s food price index / Bringing nutrition back into climate change talks / Grain market outlook, end October 2010 / How the World Bank is leveraging the new food crisis. The Dairy Price Index averaged 221 points in January, up 6.2% from December, but still 17% below its peak in November 2007. A firm global demand for dairy products, against the backdrop of a (normal) seasonal decline of production in the southern hemisphere, continued to underpin dairy prices. The Sugar Price Index averaged 420 points in January, up 5.4% from December. International sugar prices remain high, driven by tight global supplies. By contrast, the Meat Price Index were steady at around 166 points, as falling prices in Europe, caused by a fall in consumer confidence following a feed contamination, was compensated by a slight increase in export prices from Brazil and the USA. “The only encouraging factor so far stems from a number of countries, where – due to good harvests – domestic prices of some of the food staples remain low compared to world prices,” Abbassian added. FAO emphasized that the Food Price Index has been revised, largely reflecting adjustments to its meat price index. The revision, which is retroactive, has produced new figures for all the indices but the overall trends measured since 1990 remain unchanged. Forty-eight ministers of agriculture from countries large and small, poor and rich, met in Berlin to talk about food and about how people in their countries put two meals on the table. They ought to have got to grips with the prices question, they ought to have called for justice and equity, they ought to have represented what the poorest and most vulnerable in their countries want. They didn’t. Instead, they have released one of the sorriest, weakest, most unfocused and pointless statements I have seen in recent years on the subject. This piece of diplomatic puffery is called ‘Final Communiqué of the 3rd Berlin Agriculture Ministers’ Summit 2011 in Berlin on January 22nd 2011’. It explains: “At the ‘3rd Berlin Agriculture Ministers’ Summit’, agriculture ministers from 48 countries came together to exchange experiences and ideas on how trade at local, regional and global level could contribute towards food security. 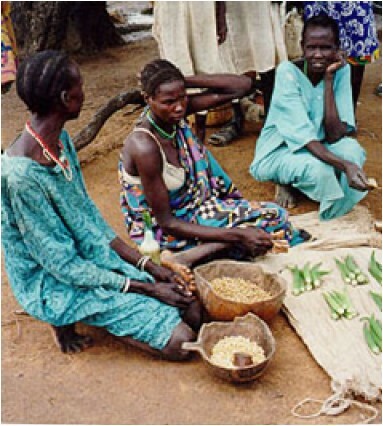 They are convinced that sustainable and regional production and an integrated, rules-based trading system, are prerequisites for making food security and the right to food a practical reality’. Note the heavy-handed propaganda techniques employed in this communiqué. “Economic growth” appears early, in the second para, and is found to be “inextricably linked” with the provision of sufficient and nutritious food. Note that private investment appears in the third para and the ministers emphasise that it must increase. Of course R&D is all done privately now, and national agricultural research systems must be arm-twisted to turn over their best and brightest to the agribiz giants. Note that “climate change”, some muddy notion of “responsibility” and an equally muddy notion of “sustainable” comes early in the communiqué. This is done so that the environmentalists cannot fault the ministers for ignoring ground realities, but is not explained by any operational directives arising out of this meeting. Note that the term “integrated” is used early. I’ll explain the significance below. Note that “markets” makes its first appearance in the text in para eight, and here “integration” is immediately linked to this term in the following para. This is sought to be justified by invoking ideas of food security and “global economic development”. Note that “value creation” comes next as a keyword, and is attached to the idea of “producers” (who I am sure are not meant to be smallholder farmers) and the familiar tautology of “fair competition”. Note that “smallholder” does in fact turn up in the following para (ten) but only as a recipient of “due regard” and only provided they “integrate” themselves with markets. Note that “trade” is the glue which, in this view of the agricultural world, binds everything together. Note that “markets” and a “trading system” are important enough to be in a puff para together. Note that developing countries must be “supported” in the primary quest to remove “technical” and “institutional” “obstacles” to – what else? – trade. Note that the Doha Development Round (which collapsed unceremoniously) is resurrected in para 14 as the new champion of this global agricultural vision. Note that in para 15 the Doha Development Round is further held up as being a signal contributor to “global food security” and that this is vital to “the poorest countries”, a precondition of which the World Trade Organization chief negotiators are strongly urged to recognise. Note that “markets”, “price” and “free and transparent” all appear in the same para (16). Note that “price volatility” follows immediately thereafter, as being evident throughout the world (now just how did all that happen?) and therefore “risk-protection” measures are required (such as markets, of course). Note that the statement ends with a hurried hodge-podge of a conclusion and a fireworks of “market” and “price”. If you have the stomach for such vacuous declaiming, the original statement is here.